Solve the puzzles of an old pirate and find the treasure! Select from two game modes – easy and casual. Challenge yourself by changing the number of pieces from 10 to 300! Use the special magnifying glass to get a better look at the smaller pieces. Control the game's difficulty to make it suitable for players of all ages! Can you complete all of the puzzles? Caribbean Jigsaw is rated 3.3 out of 5 by 8. Rated 5 out of 5 by pennmom36 from Jigsaw Puzzles With caribbean Flair! I love the beautiful Caribbean pictures available from sea turtles to beaches. The only drawback I have is that there are only 18 puzzles in each box with 4 boxes total. You can choose Easy or Casual settings and there are 7 trophies to earn. You can modify any of the puzzles offered and choose from 10-300 pieces as well as the shape of the puzzle and if you want the pieces to rotate. You can choose from 4 different background colors and the resolution setting. There are options to display the image up to 3 times the size or ghost the image on the background. There are also options to show only the border pieces and you can use the box to store extra pieces to make more room. There are available hints and a magnifying glass too, enjoy! Rated 4 out of 5 by dachsy from Excellent features but puzzle numbers limited This Pirate-themed jigsaw game from 8 Floor is excellent in many respects, but the number of different jigsaws in the game appears to be limited to 72 puzzles (at least in the trial version anyway). There are 4 boxes, each containing 18 puzzles. On the plus side, the graphics are high resolution and sound effects are very good. There are options to change the puzzle cut (shape of pieces), to alter the number of pieces in a puzzle (from 12 to 300), and to rotate puzzle pieces. 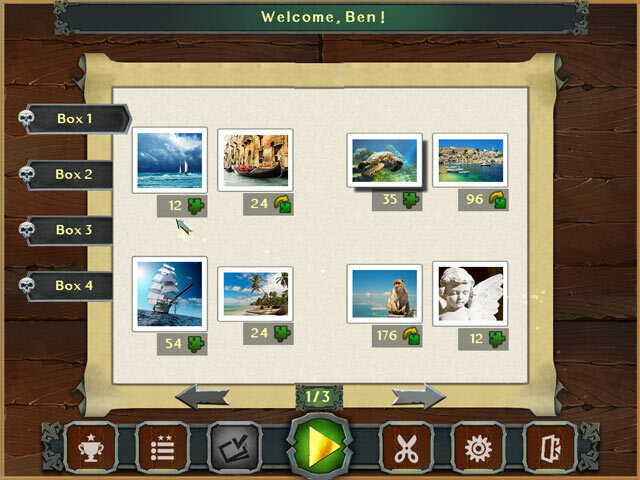 Other good options are being able to have only the border pieces showing on the puzzle area, with other pieces not in view until all border pieces are placed, and being able to lock pieces on board, after they are correctly placed. There is also a 'sort' option, and a box to put pieces in until required. There is also an option to have the 'ghost' image on the playing area, but I thought this was overly bold, and there was no way to make it more subdued. The ambient music, which I expect you could call pirate-themed is rather awful and too intrusive for having as a background-sound for doing jigsaw puzzles. You will probably want to turn it off. 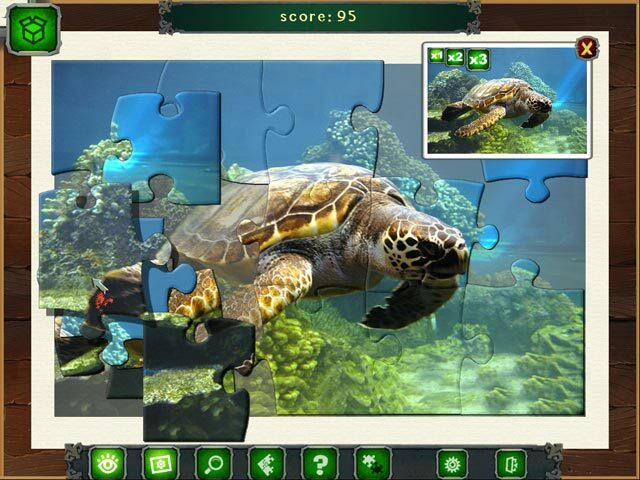 The puzzles are not timed per se, but you are awarded a score for both time taken, and accuracy of piece placement. 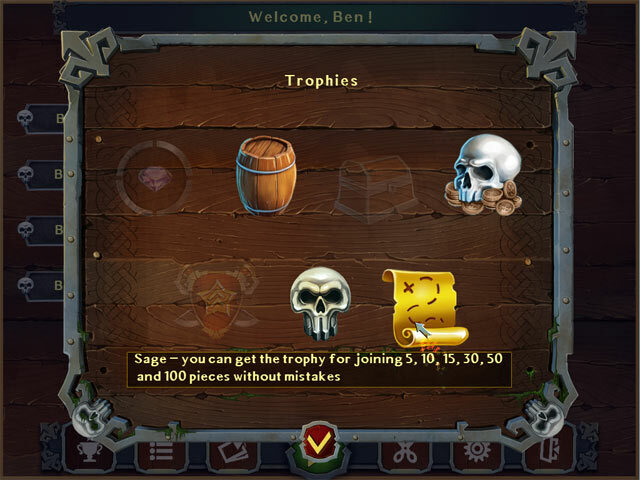 There is a scoreboard for each puzzle, and also achievements to be won. Despite the few shortfalls, this is a decent game which should appeal to most jigsaw followers. Rated 3 out of 5 by bunnydog from Poor Title I felt the choice of pictures for some of the jigsaw puzzles did not match the title of the game. For example, a picture of bison or what looks to be a mountain in the Canadian Rockies would not be suitable for a Caribbean theme. Nice pictures but they don't belong in this game. As others have commented, the number of puzzles is less than other games from this developer. A good enough game for a punchcard purchase or daily deal, but longer games are available if buying using a credit. Rated 3 out of 5 by puppynurse from Where is the rest???? Okay so I love the jigsaw games, it is a relaxing change of pace for me, and I was real excited to try this one, however there are not nearly enough pictures in this game to justify the 6.99 price tag, I completed 6 puzzles and still have 27 minutes left in the demo, so I will not be purchasing this one. Not enough puzzles to justify the price. Now maybe with a credit or on sale I might but otherwise it would be a NO. Rated 3 out of 5 by TurkeyFur from Where's the rest? Great puzzles, love the Caribbean theme, BUT seems to me the last puzzle put out had over 900, not the few this time around. It might be worth getting on sale or with a free coupon, but don't think I would pay the regular price for this one. Giving it a 3 rating because there could have been way more puzzles. Other than that, graphics are good, awesome puzzles to do, just not enough of them. I so wanted to love this one but not this time. Rated 3 out of 5 by Slowpokie from Why so few? The puzzles are beautiful and fun but why so few this time around? I love jigsaw puzzles so I am a little sad that this set only comes with around 70 puzzles. I love the theme with all the animals, landscapes and ocean pics. It just seems a little puzzling to me that they gave so few puzzles in this collection. I have mixed feelings on recommending this to anyone. I guess you should just try it out and compare it to the other jigsaw puzzles already out there. Rated 2 out of 5 by mrm2006 from Yo Ho Ho and a Bottle of..................What? 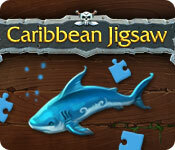 It is advertised and and inferred that this jigsaw puzzle game is all about a pirate's treasure. What pirate, I ask. National Geographic's Coffee Table Book of Pleasant Photography? (No book exists - it's an analogy). Storyline: None - would have been better if it had one. At least then it would have SOMETHING to offer. Graphics: Here, I have to admit, the devs did come up with more than their usual drivel offered. You CAN make the pieces change shape - ever so subtly. You can, I believe, change the NUMBER of pieces of each puzzle - up to and over 250 pieces. The colors are indeed bright and colorful. What you CANNOT due, as hard as you, try is to make this game fun. Game Play: Change the way the puzzle pieces look - change the number of pieces - no save feature for your finished masterpiece. Oh bother. What masterpiece? You go through this devs typical "box" of pictures. There are, I believe, 4 boxes, each containing 3 pages of pictures. Pirate pictures? Frigates? Sloops and Barges? Treasure Chests and bounty galore? No. The boxes contain no rhyme or reason how they are put together. They also do not depict ANYTHING remotely Pirate related. Is this, then, false advertising? LEGAAL!!!!!! As you can plainly see, this Glam-ma was highly unimpressed with this devs latest BOX of unimpressive pictorials. If it says "Caribbean Jigsaw" with a Pirate's Chest pictured and alludes to pirates in the description, I expect PIRATE related pictures. Not the Carnival cruise line and sea life. Ok. the sea life was cool - but KRAKENS and SEA MONSTERS would have been better. This Glam-ma is still going to ask that you please play the demo - it's free - it's an hour. But. put your "shiver me timbers" expectations away. There is a MUCH better jigsaw game on the BF game site. But, like me, you will have to play 3 million gazillion jigsaw games to find it (ok, there aren't really that many on here - it's an exaggeration). And I am only going to recommend it for people who might actually enjoy having the wool pulled over their eyes. The review of this game is based on this Glam-ma's opinion - and only mine. Therefore, if you found this review to be helpful, please click on the "yes" button below. There is also a "no" button. Seriously? You'd give your Glam-ma a "no"? Kidding. Happy Gaming! Solve the puzzles of an old pirate and find the treasure! Challenge yourself by adjusting the game mode and puzzle pieces.